St. George News, April 14, 2018 – ST. GEORGE – Over 3,000 undeveloped acres spanning from the city’s southern end to the Arizona border is the site of a large development project presented to city officials Thursday. 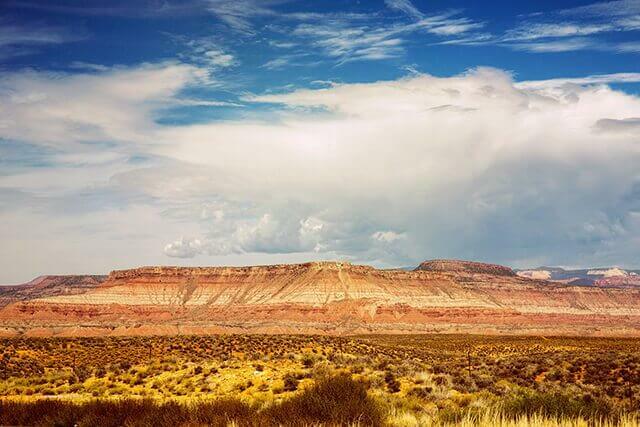 The project is being called “Desert Color” and picks up a process started over a decade ago proposing to make the area a regional destination. Located on the east side of Interstate 15 between Exit 2 and the Arizona border and stretching toward River Road, mass development of the area has been in the works since 2004. 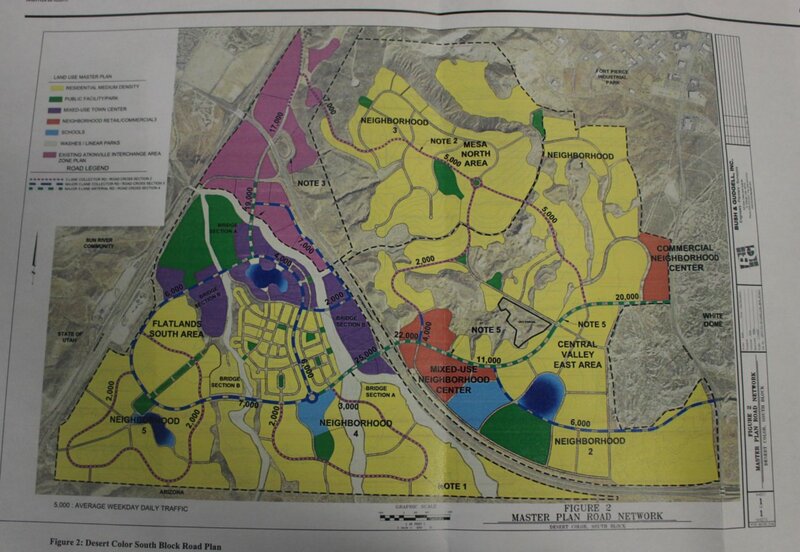 Originally started by the Utah School and Institutional Trust Lands Administration, or SITLA, a framework for a several neighborhoods sporting up to 13,000 new residential units – potentially accommodating an estimated 35,000 new residents – was approved by city officials in 2007. “It’s like a new city,” Mayor Jon Pike said. 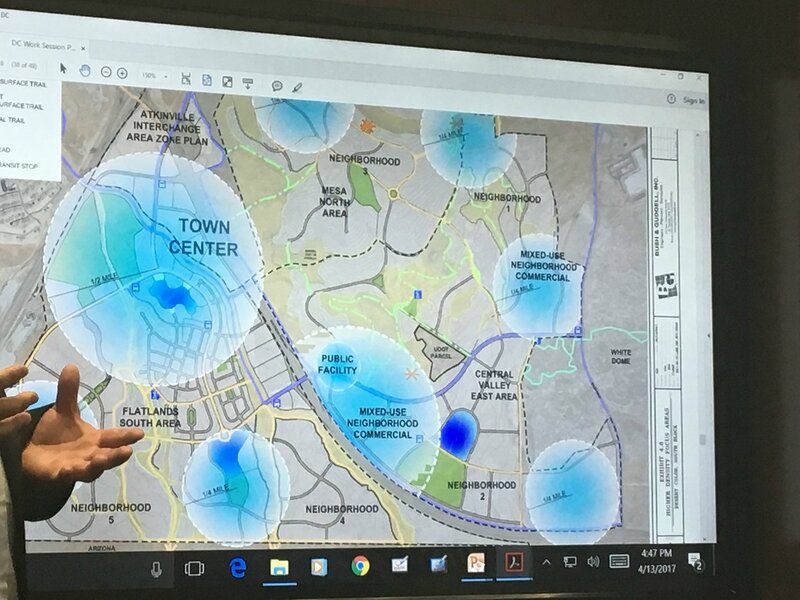 What was presented to the St. George City Council and Planning Commission Thursday was an updated version of plans for the area being spearheaded by Clyde Companies, though multiple groups are involved. Building on the original framework created in 2007, planners seek to create a more efficient, less automobile-dependent pattern of development in the area, project manager Brooke Cole said. The 13,000 resident units will be scaled back to 10,000 over 3,300 acres, which would include mixed commercial-residential developments, as well as 2,500 acres or more of open space. Plans are also geared toward creating a walkable community that includes a trail system and mass transit. A large sports park facility is slated to both anchor the project and draw people to it, as well as a commercial center that Cole said is designed to be its own destination spot. “Our vision is to create draws that aren’t here already,” Cole said. “We would like to build a destination sports park – a large sports park that can host a variety of teams, not just fields sports,” he said, using archery and horse shoe competitions as examples. As for the concept of a regional commercial draw, that includes the creation of a town center that Cole compared to City Creek in Salt Lake City, a place that has a bit of something for everyone he said. The town center is planned near Exit 2, also known as the Atkinville Interchange. This area would include a mix of additional commercial development that would include hotels with short-term rental properties also offered to visitors. A primary goal planners have for the city’s southern end is creating a place where people will not only live but also come across regional lines to shop and recreate. As for the commercial center, planners believe it can be built in the near future, along with a mixed commercial-residential community to go along with it. Waiting for the rooftops to develop in the area around the proposed center could take years or even decades, Cole said. The sports park and town center are two of the five elements Cole said are needed to make the Desert Color project a success. The other three elements include the addition of resort and traditional hospitality locations (short-term rentals would be overseen by a management company), the creation of a new age-restricted community for retirees similar to SunRiver and “flexible residential” space left open to be developed according to future market demands. While the project is ambitious, a member of the Planning Commission asked about water, a concern other members of the commission and council repeated. Planners propose creating a secondary water system for Desert Colors that uses the city’s reuse water, which could cut the demand on culinary water for items like watering landscaping. They also propose cutting back on lawns for residential units. People may want larger backyard, Cole said, but he added that a public space could be the backyard that someone else takes care of. Water conservation was considered as planners updated the plans for the area, he said. “We’re certainly concerned about the water too, but there are ways to deal with it,” City Manager Gary Esplin said. This could involve the city reviewing how the it uses its water resources, he said. While there was some doubt expressed by Pike over the viability of the proposed size of the project’s sports park, reception to the updated plans for the city’s southern end was largely positive. The updated plan will go before the Planning Commission for a requested general plan amendment either later this month or in early May. If approved, it will then proceed to the City Council. The first homes are coming! Comments Off on The first homes are coming!